Have you ever seen a shaving cream which has the function of shooting? 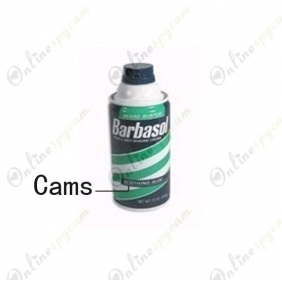 If you are interested in this kind of shaving creams, you may want to hold this product yourself.This is a Shaving Cream Spy Pinhole Camera. It has a beautiful looking. From its appearance, there is nothing different from the ordinary shaving cream bottles. The tiny camera is set in a secret position inside the shaving cream bottle. Because of its good disguise, you can shoot some wonderful videos in secret. As a professional bathroom spy camera, the quality of the image is very important. The resolution of the camera is up to 1280*720. To get good-quality video image is a piece of cake. This product has a large capacity battery and an 16GB memory card built itself, you don’t need to plug in other batteries or cards and it can work last for about 8 hours. Hope to record something without notice? This Shaving Cream Spy Pinhole Camera is such a wise choice.